Circle of gems features a rubber core base. Focal beads are added and the design is embellished with pearls, crystals, or semi-precious stones with unlimited variations to make an elegant cuff. These can be worn in multiples to enhance the design. This printed copy is 8 pages long and is full of detailed photographs and computer illustrations. Items needed and not included: bronze/silver focal beads (optional), Size 11 seed beads in three colors, Size 15 seed beads, 40 or more 3mm bicone crystals in two colors, Size 11 Delica cylinder seed beads in three colors, beading thread, Size 12 beading needle, bead mat, and 3mm rubber cording, (optional-1/2" strip of polyolefin heat shrink tubing, E-6000) Technique: Netting, peyote and embellishment. 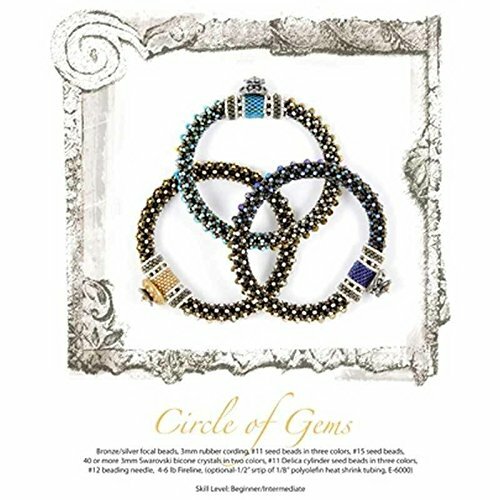 Skill level: Beginner/intermediate Bead weaving experience is recommended You will receive a "Circle of Gems" Printed Pattern. View More In Jewelry Patterns. If you have any questions about this product by Tamara Scott Designs, contact us by completing and submitting the form below. If you are looking for a specif part number, please include it with your message. Cool Tools - Flexible Mega Tile - Body Wave - 9.25" X 6"
FlexiStamps Texture Sheet Windows Inverse Design - 1 pc.